For new operators of express and flex-serve sites, there is a list of must-have equipment and tools that a carwash needs before the location opens. While the temptation may be to spend as little as possible on these essentials, many sources indicate that buying based solely on price can be a costly mistake. Instead, smart purchasing practices balance price consciousness with quality and durability considerations. One necessity where new owners actually save money by spending a little more is the carwash towel. Towels have hundreds of uses in the typical car care business, and this seemingly basic tool can be depended on to drive repeat business and improve customer satisfaction. Before opening a site for business, new operators should be educated on the different types of towels available, proper laundering steps, how and why to start an exchange program and ways to decrease theft. When purchasing towels, the first decision a new operator will have to make is the choice between microfiber or cotton. It is important for new owners to consider different factors when making this decision. While towels themselves have not changed too much in the past decade, the popularity of microfiber has increased, says Valerie Sweeney, vice president of ERC Wiping Products Inc. The construction is somewhat similar in both types of towels. Cotton terrycloth is made up of thousands of loops. These loops create literally hundreds of square yards of cleaning surface, explains Joe Gartland, owner of Towels By Dr. Joe. Microfiber towels have unique splits built into their design. These splits microscopically increase the surface area of the towels exponentially. This is the secret to microfiber’s great performance, Gartland notes. Microfiber is designed to wick the water off of vehicle surfaces, and it will hold more water than a traditional towel. Gartland states that a cotton towel will absorb liquid the same way medical gauze does, but it can get saturated quickly. Comparatively, a microfiber towel can hold up to four times its weight in water, so it will hold more water than a cotton option. Next, cotton towels produce lint, and when they age, more lint is generated. There are cotton options available that are made with lint-suppression technology, but they still release lint, Gartland reveals. Microfiber, even as it ages, does not create lint. When a traditional towel is washed and extracted at a carwash, it still holds a fair amount of water, Gartland notes. When a microfiber one is extracted, more water leaves the towel. The microfiber price point is either the same as a cotton towel or costs a little less, Gartland states. While a cotton towel may last three or four months in the carwash environment, a microfiber will last up to 2,000 years in a landfill. “Between the lint, the sustainability of the towel [and] the performance, microfiber has it all over cotton towels,” adds Gartland. One downside to microfiber also involves its unique split fibers. Even though a carwash owner may wash microfiber towels regularly, the split fibers begin to gently and slowly accumulate whatever they are cleaning, Gartland points out. Each time a microfiber towel is washed, it holds on to a small, microscopic percentage of what it cleaned. Then, the fibers begin to mat together. “That’s not necessarily true of cotton towels because they don’t really clean as well or hold as much,” Gartland reveals. Microfiber towels will need to be washed with a special or stronger detergent to be revitalized, and this product is available from several providers. Gartland notes that it’s similar to a detergent used for cleaning work clothing. Next, Gartland stresses that microfiber cannot be dried in a dryer with heat because it is synthetic. The heat will cause melting, and the absorbent fibers will fall together. Finally, microfiber towels should not be washed with cotton towels. Microfiber is so aggressive at attracting materials that it will attract all the lint off the cotton towel. “You’ll never get that off the microfiber,” explains Gartland. One of the challenges carwash owners experience is that many towels are lost or damaged before they reach their full lifecycle, Sweeney notes. Operators will want to work proactively to prevent loss or theft. Towels usually “disappear” for two reasons: Employees leave them in vehicles or customers “borrow” and never return them. “If employees are leaving the towels in cars, they need to be reminded that towels are important tools, and as with any other tool at the carwash, they should be held responsible for them,” Sweeney says. Some carwash managers monitor the towel inventory by counting them daily or weekly, and each employee should be made aware of the count. Supervisors should also check vehicle interiors during final inspection for towels that may have been left on the seats, floor or dash. Customers sometimes ask for a towel to wipe a spot, or if the towels are in an accessible place, they may just take one. If a customer asks to use a towel, Sweeney recommends an employee instead offer to wipe the spot. This will demonstrate that the wash has great customer service and, at the same time, ensure that the towel will be returned. As an added incentive for regular customers and to encourage brand loyalty, some carwashes have started towel exchange programs. “Carwash owners purchase a fairly unique microfiber — let’s say a black microfiber with a red band or something like that,” Gartland explains. “They’ll sell them to the customers to dry their own cars.” The customer will only have to buy the unique towel one time, and each time he or she brings that dirty towel back to the carwash, it is replaced for free. “It’s sort of like a perpetual motion machine,” he adds. Sweeney notes that many washes also offer courtesy towels to customers. These can be a disposable paper wiper or a lower-cost bar towel that is meant to be returned after use. The bar-style towels, which are generally 16 inches by 19 inches, are inexpensive enough that if a customer takes it, it is not a big loss. But, the towels are durable enough that a carwash owner can wash for reuse. One key to prolonging the life of carwash towels is to keep them separate. Ideally, different towels should be used for each part of the vehicle, according to Sweeney. An operator can keep the wash’s towels separate by using two or three colors — one for each specific job — or different types of towels can be used for different jobs. For example, use only microfiber on the windows and terrycloth on the body. Also, a separate low-cost towel should be utilized to wipe greasy wheel wells and door jambs. 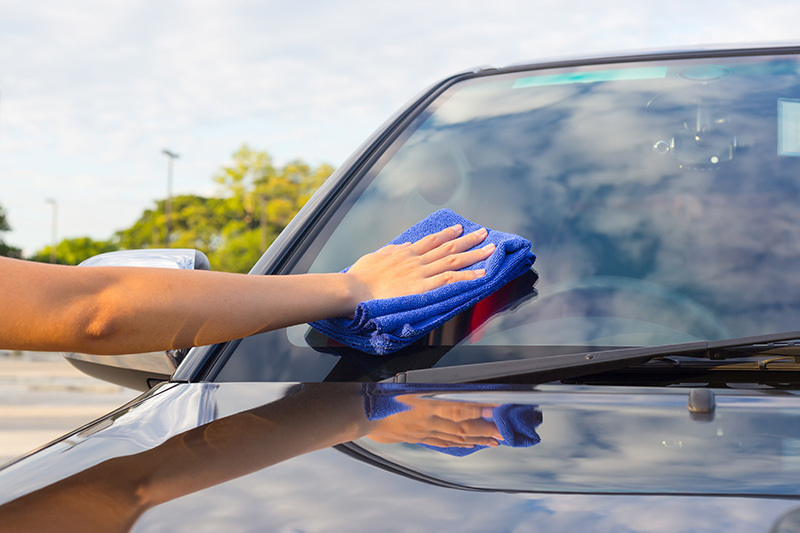 Since grease is hard to wash out of a towel, it can cause streaking if a towel is later used on vehicle glass, Sweeney states. Another cost-effective option is to keep an inexpensive box of rags around for maintenance work. Additionally, a box of spill control pads or socks for spills, leaks and drips will reduce the chance that an employee will use towels for the wrong purpose.